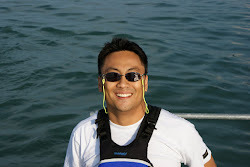 Ever since Hotmail, viral marketing has been the summum bonum ("highest good" so to speak) in the information economy and is still the most effective way to grow an online business. Since users do the marketing job as product invitors and invitees, customer acquisition costs virtually become zero. As David Skok extensively explains the findings for the viral growth formula, K does have to be bigger than 1 and the shorter ct the steeper the upward sloping curve. 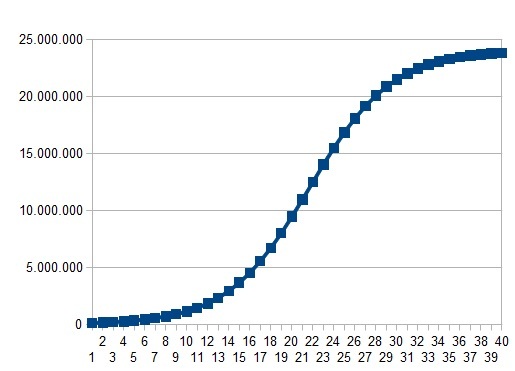 Example: if you take a cycle time of 2 which means it takes two days from the discovery of a an app to sending out an invitation which then leads to a successful download by the invitee, and K = 2 (each invitor sucessfully invites 2 invitees), then the result will be 20470 cumulative users. Half the CT and you could end up with ~ 21 million users. This sounds very much like the Hal Varian teachings which state that information industries with strong network externalities often can end up in a "winner-takes-it-all" scenario. Although there are examples like that in the Internet, like Facebook or Twitter, for apps especially gaming apps this might be rarely the case. As David Skok himself writes his model has two drawbacks: 1. user attrition which I would call "churn", 2. user saturation which I think becomes more of a important issue in this discussion. Why ? 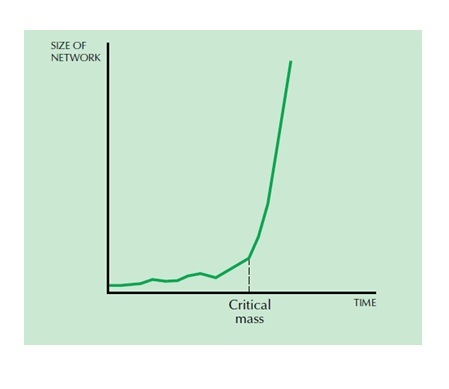 Because viral distribution usually follow an S-curve pattern like viral diseases do. In other words, infectors at a certain point in time start to meet more and more infectees as time goes by. I remember disproportionately more people telling me about Gangnam Style a few months after it hit Europe. Another discounting factor is app consumer taste. E.g. 30% probably never play gaming apps. Though I prefer the above bottom-up approach because of its major two keen findings, it needs to be combined with a top-down approach that takes into consideration the overall addressable sizable market and viral saturation. Further the sigmoid function gives T0 (the tipping point of the curve) which shifts the timeline and alpha stretches or compresses time. The alpha value is 1.03 (quite steep) and T0 (tipping point) is at day 22. Note that after the tipping point the curve flatens due to the redundancy effect of viral distribution. Virality often was never planned but just happened. 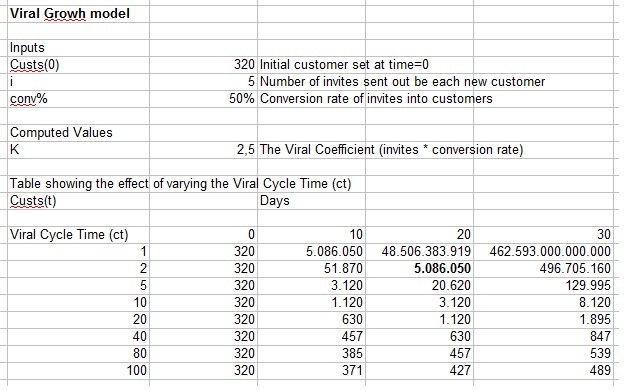 However, two levers from the Skok model (cycle time, viral coefficient) can be used for beta testings (A/B) prior and after launch so that you optimize the overall virality on a continuous basis. Take the Brandwinder algorithm with a target value and get a feeling for how much is actually possible by limiting the inflated values via the inputs addressable market, total peak value and growth trajectory through value 1 and 2. This article does not cover actual tips. I will do this in a future post.